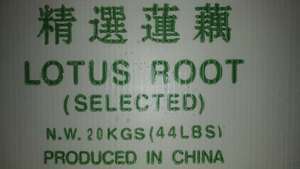 Guangzhou Sunny fresh vegetable and fruit trade Co., Ltd. mainly sells: fresh selected lotus root, vacuum lotus rootshallots Kudzu Horseshoe Winter melon and other fresh fruits and vegetables. The products are sold to countries such as Singapore, Malaysia, the United States, Canada and other countries. The registered capital of our company is 1 million, and it has the food business license after the customs and the commodity inspection. It has high standard, the area of modern factory building is more than 2000 square meters, the area of cold storage is more than 300 square meters, and the planting base is more than 1000 mu. Our company takes a long view and actively introduces international advanced management technology and equipment, and trains a group of highly qualified workforce to provide strong guarantee for the quality of products. Our company is constantly exploring and developing in the vigorous development process, striving to improve the level of technology and management, and at the same time, focus on business expansion, and strive to establish good communication with customers. We will be adhering to the "careful management, continuous improvement, climb high" concept, ride the wind and waves, Yun fan, to work together to achieve a better vision of our. At the beginning of the establishment of the enterprise, the founder of the enterprise is in line with the core concept of "people-oriented, honesty and innovation, service leading and endless pursuit". For the future, a long way to go, we will always uphold the "integrity services, perfect" service concept. For a long time, the Guangzhou Sunny fresh vegetable and fruit Trade Co.,Ltd adhere to the "efficient circulation for farmers, for the public safety integrity" business purposes and "business innovation, service excellence, fine management, efficiency first" business philosophy, adhere to the use of modern logistics idea, guided by the market, consumer demand for power. Welcome to Guangzhou Sunny fresh vegetable and fruit trade Co., Ltd. to visit guidance, negotiation and patronage. Thank you.